Dr. Eggman is causing havoc again and it's up to you to maneuver a team of three Sonic characters through massive levels. All 12 characters--divided into Team Sonic, Team Dark, Team Rose and Team Chaotix--have their own unique strengths, so choose your teams wisely. Find the best combination to complete missions full of enemies, puzzles, and huge environments. No matter what team you choose, the only direction is forward and the only way to get there is fast. I’m so happy to have this game again! It came in really good condition. Plays just like I used to when I was a kid. Will definitely buy from Lukiegames again! 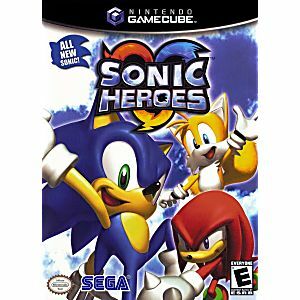 Sonic Heroes stars Team Sonic (Sonic, Tails, and Knuckles) Team Dark (Shadow, Omega, and Rouge), Team Rose (Amy, Cream, and Big), and Team Chaotix (Vector, Charmy, and Espio) as they travel various lands, each with their own simple story. As they travel through each of the lands, each team utilizes teamwork, each team having a three types of characters with unique abilities. Those types are speed, power, and fly. Utilizing all three types, the player has to utilize the unique abilities to traverse the obstacles of each land, as well as solving puzzles and battling various robots. Now while some might find the game to be repetitive and dislike that each team just happens to be going through the same environments, the layout for each of the teams has variations and missions here and there to make up for that. Interestingly, a game that has a setup that involves going through many stages fighting enemies four times to reach the "true final boss" would be Teenage Mutant Ninja Turtles (2003). Well, except the GBA version of the game. For to unlock the final boss in that game, the player has to play as each of the four turtles through the same exact series of levels, with the same exact stories, in the same exact layout. I'd honestly recommend to play that game alongside this game just so you all have a better idea for what I'm talking about. And to be clear, I'm not insulting the game (the game itself is fine, but there's better), just comparing one game to another. Now getting back to Sonic Heroes, the game also has scripting issues in certain areas. However, most of these can be bypassed by either holding forward or backward. Trust me on that on. One of the more infamous scripting error with Sonic and Shadow when performing the Light Speed Dash, where when performing it on the ground, there's a chance of the team falling to their doom instead of continuing on. Whatever you do, always perform that maneuver in the air, where it is much more safe to perform the maneuver. 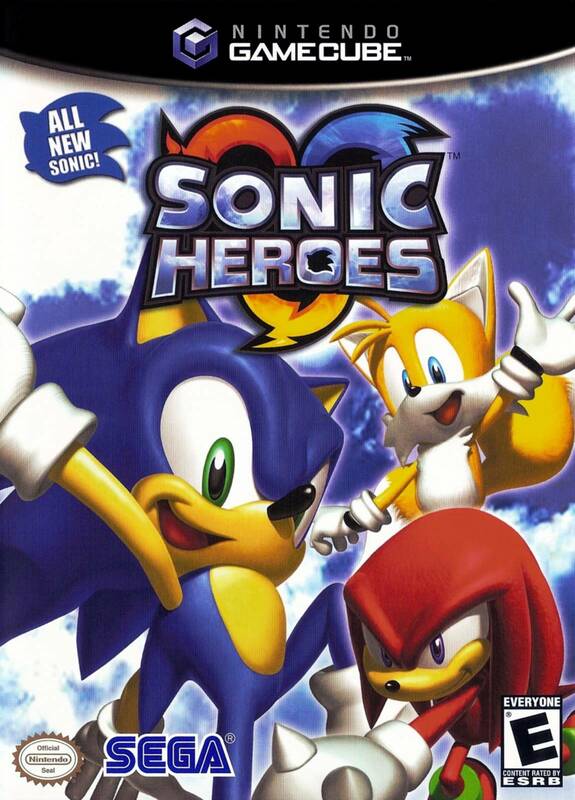 This game is perhaps one of the few Sonic games that is structured around achieving 100%, evidenced with the "Get All "A" Rank" message if you haven't beaten all of the missions in the game with an "A" rank before completing the story. My advice would be not lose any lives, collect as many power cores as possible to increase the score and power of your team, and utilizing every little "quirk" that each of the formations and teams have. You can do it, because you have teamwork on your side! :)! The game works just fine!! Super happy I got them here! This game came in perfect condition. It also came in its original case. Over all I am extremely pleased. This is the second game I've ordered from Lukiegames. I'm pleased with the customer service. I emailed them with concerns about the timing and they were quick and courteous in their response. I recommend using this product. Thank you for delivering a game in perfect condition! It arrived quickly and works perfectly. My son is extremely happy to have this game :) It is nice to know a reputable company where we can purchase used/discontinued games. Thank you again! ALL NEW SONIC in Sonic Heroes ! The voice acting is poorly written and very annoying at times. I thought the Sonic Adventure series voice cast could've done a bit better. Don't let this keep you from playing though. At first, the fact you could control 3 characters at once looked very confusing to me. After a week of playing, I got used to this and was suddenly hooked on this game. I love Sonic Adventure 2 and finding out this continued the story shocked me. At times, the gameplay is similar to it such as the rail grinding. Don't turn this game down! I had this game on XBOX back in the day. This game looks as if it should be played by little kids although it is GREAT for all ages. This is my childhood right here along with the Zelda games. So glad I found Lukiegames.com NO JOKE! USE THIS WEBSITE!!! Still waiting for the game to be delivered, however I'm sure LukieGames will come through! Thanks guys! Sonic is great. If you like this type of game? A fun game fo rmy 10 year old who loves Sonic... Reasonably priced, can't beat the deal!